The masterplan of The Cedars at Yas Acres. Aldar Properties has launched The Cedars, a new community within its flagship golf and waterfront development, Yas Acres, in Abu Dhabi, UAE. The Cedars will put nature at its heart and is part of Aldar’s strategy to create distinct communities within the overall masterplan. To coincide with this, Aldar says it is introducing a series of limited time offers to make owning a home within Yas Acres even more attractive. Not only will the Abu Dhabi-based developer waive the five year service charge and two per cent Abu Dhabi municipality fee, but it is also offering customers a new 20/80 payment plan, with 20 per cent of the purchase price payable during construction and the remaining 80 per cent upon handover. 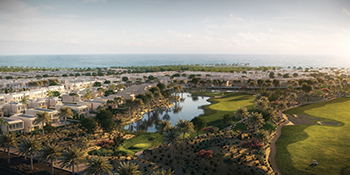 Aldar Properties’ Yas Acres golf and waterfront development. Located on the northern shores of Yas Island, Yas Acres will, upon completion, add 1,315 premium townhouses and villas to the island. Construction is under way on the three launched phases of Yas Acres, with handovers of these first 652 homes on track to commence during 2019. 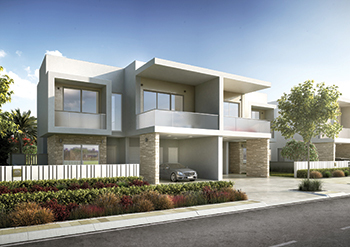 Limited numbers of three- and six-bedroom homes are still available, with prices starting from Dh3 million ($816,700). Residents will benefit from landscaped parks, running and cycling tracks, ‘shadeways’, indoor and outdoor gyms, community pool areas along with playgrounds, swimming pools, sports facilities and BBQ areas located in each villa cluster. A golf and country club will provide further amenities including an events space and dining outlets with additional local retail offerings situated within the community. A waterfront apartment district with shops and food and beverage outlets is also planned for the future, it states. In line with Aldar’s focus on delivering desirable destinations, the luxury lifestyle development features two school plots complete with sporting facilities, both of which have been acquired by a local investment firm. Yas Acres is a key component of Yas Island’s destination development strategy, and residents will benefit from being minutes away from the island’s world-class attractions and events. Yas Island is home to the Yas Marina Circuit, where the Abu Dhabi Formula 1 Grand Prix is held every year, in addition to Ferrari World Abu Dhabi, Yas Waterworld, Yas Mall, and Yas Links Golf & Country Club. In July, it also welcomed the Warner Bros. World Abu Dhabi theme park – listed as a top global attraction to visit by Time magazine 2018. Meanwhile, the developer last month had a special one-week offer for its Dh10-billion ($2.72 billion) master-planned community, Alghadeer, located on the Abu Dhabi-Dubai border. Alghadeer features 14,408 residential units besides commercial properties, cultural and institutional amenities and entertainment attractions. At the heart of the premium project is Harvest, a multi-use agricultural led space featuring allotments, as well as The Hub – a F&B (food and beverage) outlet, The Studio – an educational area for training and workshops, The Shed – a dedicated area for purchasing farming tools and supplies, and The Market – a retail area for freshly grown produce, and The Field –where people can rent plots and grow their own produce. The masterplan incorporates Aldar’s existing community of the same name which boasts over 2,000 homes and is a thriving destination for many families. Construction work on the first neighbourhood is likely to start by year-end and due for completion in 2021, it added.